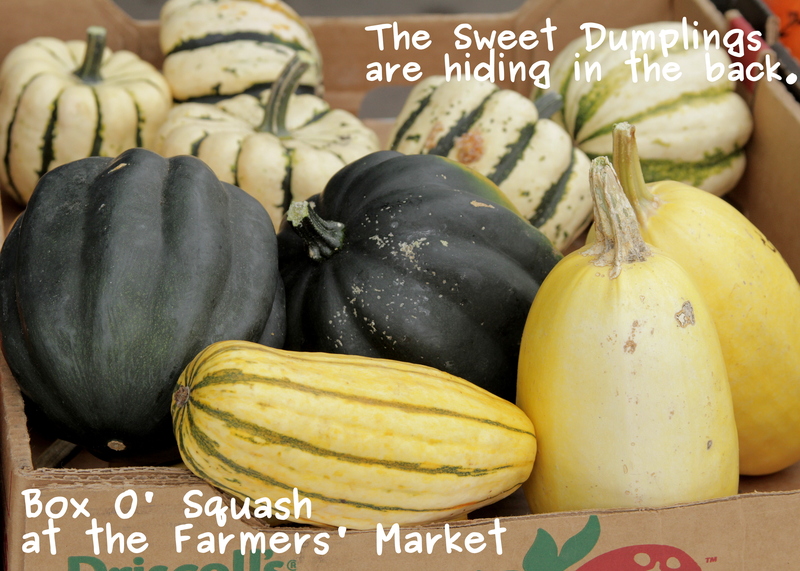 Squash is plentiful, long lasting, festive and somewhat of a puzzle. It can be difficult to get through it’s sometimes-thick skin and figure out what to do with it. I decided to figure out this puzzle by picking up four wee squashes at the farmers’ market a few weeks ago. I’ve been researching each one and looking for recipes that are more than cut in half, scrape seeds, bake and top with butter. Stay tuned to find out what I did with each squash, as well as some fun facts. 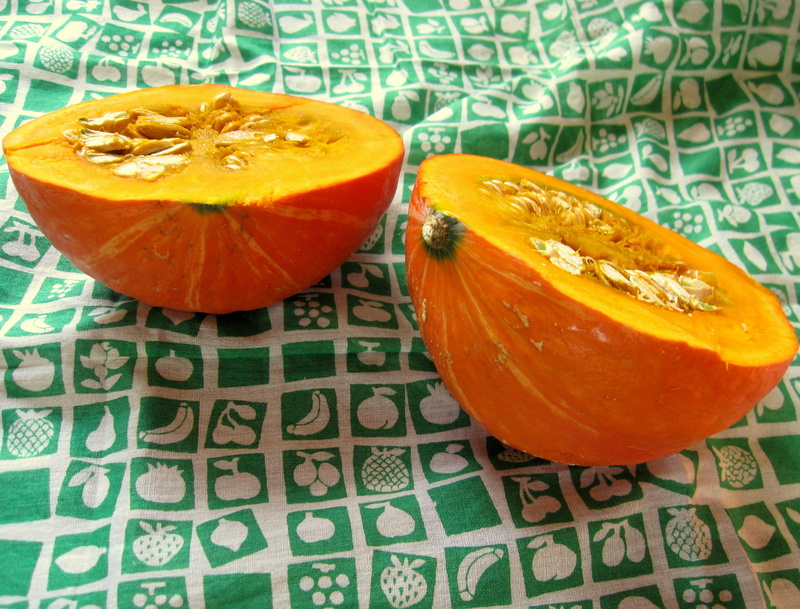 Last week, I shared my experience of preparing a thick skinned, pumpkin-like squash while I was living in China. 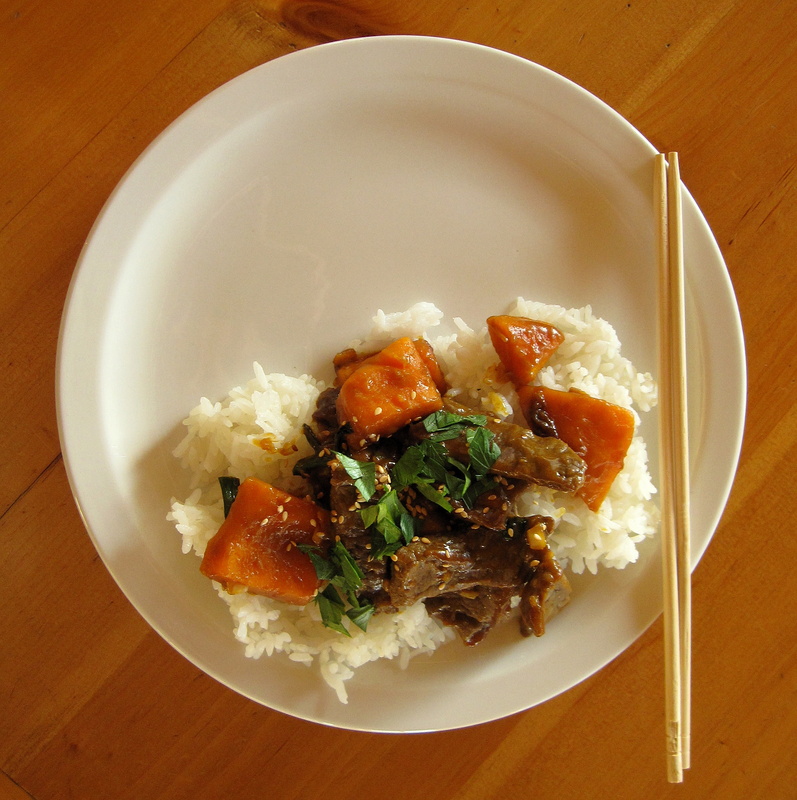 Today I’ll share with you the recipe for Ambercup Squash with Sweet Beef, prepared and adapted using this recipe as a guide. First, it’s difficult to cut this squash. Remember all the fun I had cutting a similar squash on my kitchen floor when I was living in China? Well…I learned from my previous experience. :) First, poke the squash with a knife to make some holes, then microwave it for 30 seconds or longer (depending on your microwave’s settings), but be careful because you don’t want it to start cooking. Once halved, scoop out the densely packed seeds and cut into 8 slices. You don’t have to peel them now; you can more easily remove the peel after they’ve been boiled. Boil the slices until they are softened and pokeable with a fork. Don’t over boil them because you do not want mushy squash ruining your stir fry. Drain the squash slices, rinse with cold water and allow to cool. While the squash slices are simmering begin marinating the beef. The beef needs to be thin and either cubed or cut into small strips. 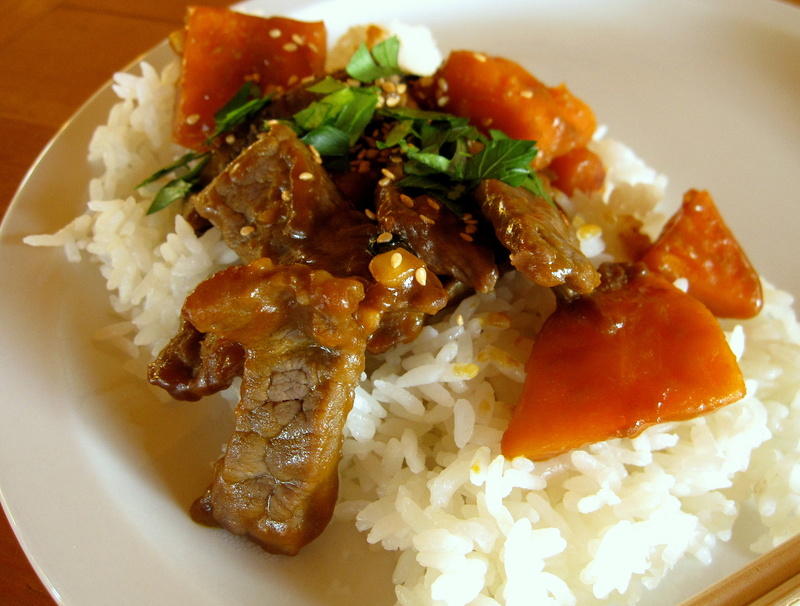 Mix the marinade of soy sauce, rice vinegar and corn starch. It should marinate at least 15 minutes to soften the meat a bit. If you do it well ahead of time, be sure to store it in the fridge. Once the squash is cooled, it’s time to peel off the skin. Unfortunately the skin didn’t peel off as easily as I’d hoped. I had to use a pairing knife to peel the now soft skin. It isn’t difficult, it just takes a bit of time. While peeling, you can roughly cube the squash. Next put a little cooking oil in a large frying pan or a wok. Add the marinated beef and stir fry for a few minutes, you want the outside to begin changing color but only just. This is a Chinese cooking technique that helps keep meat tender when stir frying. Once the meat is lightly cooked, remove and place in a dish (don’t worry, we’ll cook it more later). Add a bit more oil to the pan and add the garlic and the squash. Sauté for a few minutes, but be careful not to break apart the chunks of squash. Then add the beef and stir fry altogether. After a few minutes add the sauce. Stir everything together and allow the beef to cook. You can add a little water if you want your sauce to be juicier and if you want it to thicker just add a bit more corn starch. That’s it! 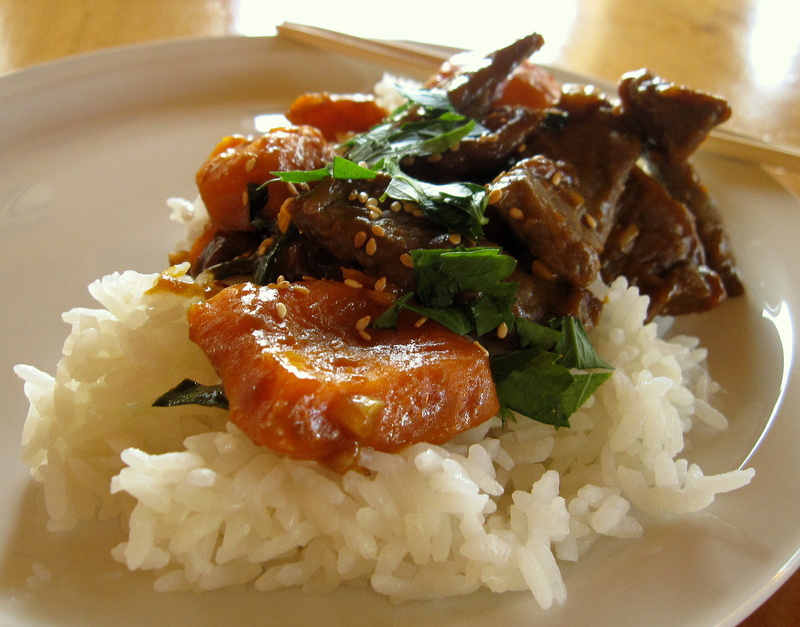 Garnish t with sesame seeds and cilantro and serve it with a side of steamed rice. My family members enjoyed eating something different and I loved the colors. Have you ever prepared a squash-y stir fry?